When you see Aurora, you are witnessing a reaction between charged particles from the sun and the gases in our upper atmosphere. Storms on the sun’s surface eject charged particles and plasma which travels towards earth in what is called the Solar Wind. This steady stream is caused by the sun’s super hot corona and the material can reach temperatures of 2 million degrees Fahrenheit and speeds of 500 miles per second. When these particles reach the earth, many slip into our upper atmosphere through the weak magnetic points near the North and South Poles. These particles excite gas molecules, causing their electrons to shift and releasing particles of light called photons. This process is often compared to the way the gas reacts in a Neon sign. Different types of gas in our atmosphere cause different colored displays. Oxygen can react with a green light or a red light depending on the altitude, and Nitrogen reacts with blue/purple light. Our Northern Lights Tour is offered during the times of year when this solar activity is strongest, but people often ask us when the best time of year is for them to see the Aurora. In truth, it depends on your preferences regarding a few factors: weather, scenery and hours of darkness. What Time of Year is Best for Northern Lights? When planning your Northern Lights tour you want to avoid the summer – during that time of year in the far North it stays light nearly 24 hours a day. Although Aurora activity is still going on during that time, you need darkness to see it. 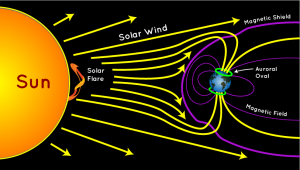 Scientists aren’t sure why, but it is commonly believed that solar activity is stronger around the times of the Fall Equinox (September 22) and the Spring Equinox (March 20). In September and October the weather is not cold yet, and while clear skies are not as reliable as in the Spring, the past few years have had incredibly colorful displays. During this time of year bodies of water will not be frozen, so you have the opportunity to see the aurora overhead and reflected on the surface which makes for stunning views and incredible photographs. October often brings some snow, but it sometimes doesn’t come until November. In November and December it is beginning to get colder, and with fresh snow you will be able to enjoy classic winter activities like dogsledding and snowshoeing. Sometimes this snow brings more cloud cover, but as the nights get longer you also have more hours in which the lights could be visible. January through March are very popular times to see the Northern Lights, although temperatures through February are quite cold (often as low as -20 Fahrenheit) so make sure you have well insulated gear. Some believe that colder nights bring more Aurora activity, and with more hours of darkness it increases your chances of a display. As March begins, temperatures will begin to rise and since the majority of snow has already fallen there are lots of clear nights. With more daylight you will have to stay up later to watch for the lights. Should I See the Aurora Soon? Solar activity fluctuates on an 11 year cycle. The last peak was in 2014, and occurrences will gradually decrease until 2020. At that point it will slowly rise until it peaks again in 2025. Aurora displays should still be strong and frequent this season, but in the next few years there will be less chances to witness it. That means the best time is right now! 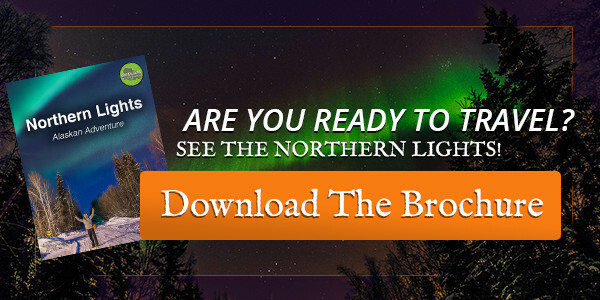 Check Out the Brochure for our Northern Lights Tour! What Hours Can You See the Northern Lights? In Alaska the peak of summer brings 20+ hours of daylight and the peak of winter brings nearly 20+ hours of darkness. With such a wide range of daylight hours, it’s important to consider what times you would like to be watching for the Northern Lights. If you are not much of a night owl, November thru January might be your best bet. In September and October there will be decreasing hours of daylight (14 to about 11), while November into December it will decrease from 8 hours of light to about 5 hours. In January through March the hours of daylight slowly increase from 4 back up to about 10. Whatever time of year, your best chances of seeing the lights will always be between 10pm and 2am. Fortunately on our Northern Lights Ecotour your guides will stay up late so you don’t have to. We track the solar activity forecasts, scan the skies and provide wake up calls whenever the Aurora appears. 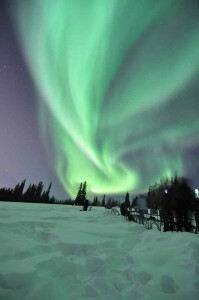 Travel Weekly Features our Northern Lights Tour! We always love to get recognition for our tours, and this month we had an exciting feature in Travel Weekly. Author Renee Brincks points out some of the highlights of our trip including: hiking with reindeer, geothermal hot springs, dog sledding and curling lesson with local players. 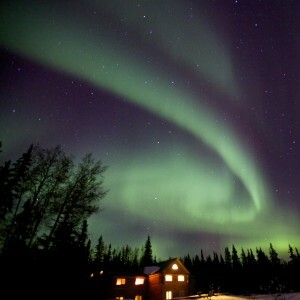 Our six night trips include all your activities and accommodations in a unique log cabin-style lodge outside of Fairbanks, where there is less light pollution for better viewing. Our trips only partner with independent businesses and we even carbon offset guest flights by donating to reforestation efforts, so you can feel confident that your money is helping to support the people and ecosystems that make Alaska such a magical place.